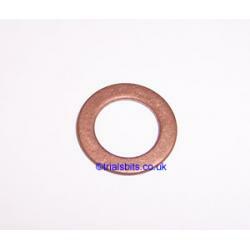 A replacement copper washer T20 Triumph Tiger Cub equivalent to original part number E1335 or 70-3253. This is used as the inner washer where the rocker feed pipe joins the cylinder head. Also used in various BSA applications where it has part number 40-0159.